Artistic Skating Forum Discussions about any topic related to artistic roller skating including quad artistic skating, inline figure skating, pairs, dance, synchronized skating, and show skating. Does anyone have experience with both of these plates? The Mistral is my favorite plate. It's so twisty and so stable. Is the Giotto the same amount of twisty and stable? I know it doesn't have a toe stop. I have the Matrix steel and it is great fun for spinning, but not as twisty as the Mistral. Mistral feels like carving through silk. I have more fun on the Mistral. Just curious if the Giotto is similar, or how it differs. Thanks in advance. I have both of these plates. I got the Mistral last year around about April. I was coming from an Atlas freestyle plate. The Mistral felt very responsive for me from day 1 and it took no time to get used to it. My spins were already good on the Atlas plate but felt tighter and faster on the Mistral. I love the mistral for jumps as its responsive, smooth and fast when you need to quickly press an edge before a jump but also rolls out straight so I don't over hook the my landings as much as I did on my Atlas. I just got the Giotto plate at Nationals a few weeks a go. It's the same as the Mistral minus the toe stop. The action is identical as well as the design. In fact the Mistral, Energy, Energy Steel and Giotto all share the same design. The difference is in the weight of the materials used to make it and the toe stop. I've been using the Giotto for figures and loops and my tracing has been much better with this plate. The response is great for pressing 3 turns but the roll out is smooth which keeps me on the line. On loops its the same. I don't have to adjust the action between the big circles and the smaller loop circles. I love both of these plates and don't see myself switching to anything else any time soon. Thanks for the responses, I'm always learning. Personally I have never skated on the Mistral. It intrigues me because I have heard there isn't much difference between all the Roll Line plates, so why the big price difference? Will the average person, even be able to feel the difference? Then why the big price difference? I will try to be exact. If the Mistral is similar to the Energy, then my Energy skate, skates nothing like my Giotto. Which brings me to my next point. I feel the difference in my Energy skate and my Giotto plate is three fold. My Energy(Steel) plate has mounted to it a rock stiff boot. My Giotto plate has a relatively soft boot. My Energy(Steel) plate as small diameter wheels of hard compound. My Giotto plate has large diameter wheels of harder compound. My Energy Plate has hard cushions, natural rubber. My Giotto plate has not as hard cushions of synthetic design. My Energy plates has the trucks adjusted loose. My Giotto plates has the trucks adjusted hard and not to wobbly. the point it's hard to believe they are the same skate. All I can say is my Energy Plate, skates nothing like any skate I have skated on before and my Giotto plate is very controllable and exact. 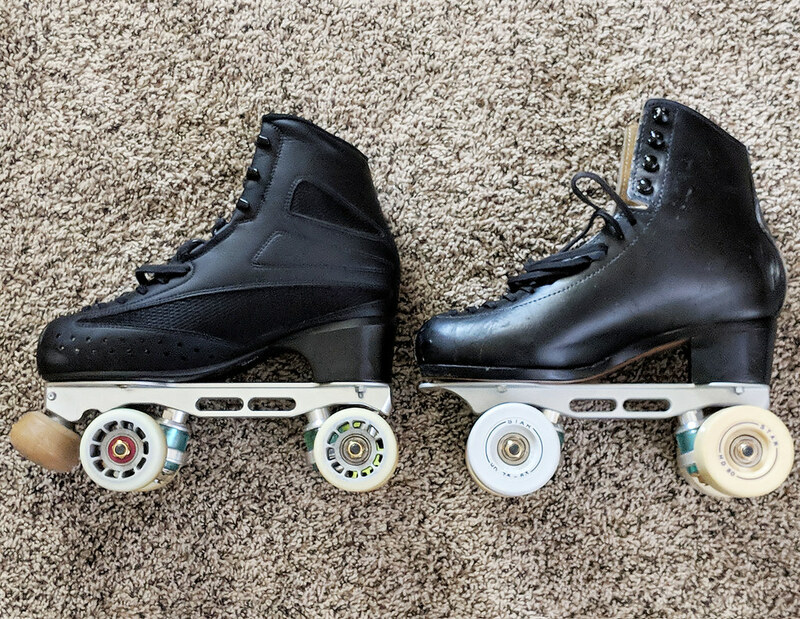 Although they are the same plate, they react so differently and I feel if the average skater, if they put on my Concerto/Energy/Leopard wheel skates they would not be able to skate on them. And if they put on my Silver Star/SP Teri/Giotto/Roll Line 63mm 64D Wheels they would say, not that is a nice setup! The second setup is a "easy" skate, the first setup is a professional, very stiff/which relates to almost impossible for a beginner to skate on. Thanks for listening and thanks for the post. I'm always learning. Larry O and God Bless you! Mark Photo, do you have the same cushions on each plate? I have the blue cushions, top and bottom (from what I understand, they were correct for my weight). How do you like your cushions set up? Also, what type of boots are you on? You may have said, (sorry, can't remember). How do you guys like your cushions? I'm beginning to think that the cushions make a huge difference (not to mention all the other variables). I think, maybe I'm wrong, that if I put a Giotto on my same skate, with same wheel and same cushions (as the Mistral), I would have the same ride. Larry, what type of cushion (or color) do you have on your Giotto? How would you compare it to the rubber? Do you skate in the Concerto for fun, or only for competition type things/training? Also, if you had to guess, which hardness would you assess your SP Teri's at? Why do you like the harder boots, is it for jumping, control, ect? I'm just trying to figure all of this out and you guys have a treasure trove of information. Seriously, there's no way I could have chosen my new skate without your help. I feel that the Mistral with blue cushions is very controllable and exact (with softer 95A Ice wheels). My boot is not a very hard boot. I believe it is exactly perfect for someone that just outgrew a beginner boot set up. I find all of this extremely interesting. Thanks again for any help and advice. you are correct the cushions make a big difference on the amount u have to pressure and the quickness of the action. Other than the length of the plate for the Giotto and toe stop, they are almost exactly identical in design. Both of my plate sizes are 160 and the distance of the axles and king pin 17 degree angle are the same. I also compared the Mistral, Giotto, and Energy Steel part numbers. They use the same part numbers for everything attached to the including the King Pin. When you get to the Energy plate it switches the truck to a Titanium axel (vs steel) and a Titanium pivot. The Mistral and Giotto use the same aluminum for the frames (not sure of the type of aluminum. The Energy Steel and Energy use Ergal Aluminum 7075. Ergal 7075 is strong, with a strength comparable to many steels. The cost of the ergal is what makes the Energy Steel more expensive than the Mistral and the energy adding the titanium axel and pivot is what makes it more expensive than the Energy Steel. I use the clear blue cushions on my Giotto and Mistral. As far as the action I have them adjusted about the same on both pairs of skates. My Mistrals might be adjusted one or two clicks softer than the Giotto but they're not that far apart. That's why I say, for me, the action and responsiveness feels almost exactly the same no matter which skate I'm using. As boots I'm currently using a Risport Super Cristallo on my Giotto plate and I have an Edea Fly on the Mistral. I think the Super Cristallo is slightly stiffer than the Fly but I prefer a stiffer boot for figures. I eventually plan to get an Edea boot for the Giotto. As far as wheels, yes I have smaller wheels on Mistral, a mix of Mustangs and Leopards, with bigger Star wheels on the Giotto. I don't notice a difference in the action with the different wheel sizes, I just know I get a longer roll on the Giotto with the bigger wheels which is necessary for figures. They are harder which allow me to slide 3 turns easier. Again since my actions are about the same for both skates for me it makes them identical in edge to edge response. The only difference for me is grip and roll length. If your cushions and actions are adjusted differently between skates, that can certainly make them feel totally different. just for reference here is picture of the Dance Plate, love the control and response from this plate. 285 boot = about US size10, with 170 Roll Line plate. 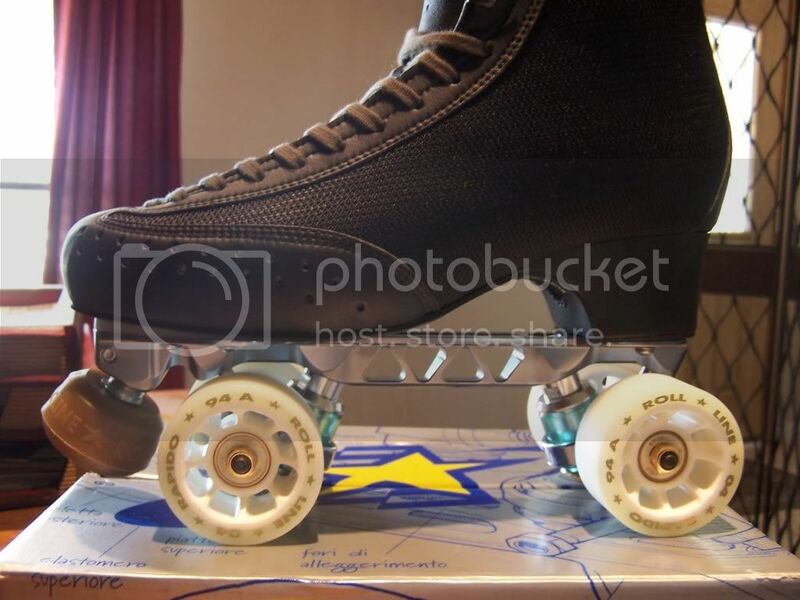 My skates ~ Roll-Line Dance, Rapido wheels, Swiss Gold bearings, and Edea FLY Boot. A little late on this post...lol! Sorry! Larry, what type of cushion (or color) do you have on your Giotto? Well the only other cushion I have in natural rubber is on my Dance plates and I have the natural yellow rubber cushions and I feel the Clear Blue are harder, but that might just be because of a myriad of circumstances...adjusted the trucks looser and the boots are low top on the Dance plates. Natural rubber seem to wear out quick????? Do you skate in the Concerto for fun, or only for competition type things/training? I skate the Concerto for Freestyle. Also, if you had to guess, which hardness would you assess your SP Teri's at? Glad you asked that question. I would guess the stiffness of my Silver Star SP Teri at 55. Why do you like the harder boots, is it for jumping, control, ect? I grew up on the stiffest boots know to man. Gold Star Riedells. I was given these boots because they would prevent the angles from twisting. Also "control" is increased 1000%. With stiff boots you can only jump straight up and down. There is no give. With softer boots you can jump at an angle and that is harder to control. It's harder to get use to a stiff boot, but once you do you can only skate straight up and down and that is the correct way to skate. All those boys that do quadruples wear the stiffest boots known to man and wear them out in just a few months. Nathan Chan is an example. He changes his EDEA boots out after just 4 months of use. Larry Otani and thanks for asking. I was glad to give input...lol! Understand Roll-Line is playing the name game here, it's BS, met to sell plates by brand instead of specifications. This is why they always leave out the most important information. Like Kingpin angle! I have written (emailed) Role-Line, they will not tell you, they don't want the information published because you will compare specifications of other brands. Of course this is just insane because they are leaving out the most important fact of all! Kingpin angle (but don't know). MANY of the Roll-line models are the same, except for weight and toe stops. I think(?) the Mistral is 15 degrees(? ), same as the energy series. Again, it's all a BS name game to keep you from comparing competitor plates. So as to your question: Try to find out what the specifications are of the two plates, otherwise the answers are all subjective nonsense. Plates are extremely low tech devices. Riedell 336 Boot , Roll-Line Energy plate, Roll-Line Panther wheels -95A, Me: 165 lb, 6'2"
Hey! Thanks for the responses. You can't imagine how many times I re-read this thread. I wanted a plate to feel just like the Mistral, but I didn't want the toe stopper. The Giotto was the right decision. I could never go back to toe-stoppers. I don't jump. They are level-appropriate. I know everyone's skate set up is constantly evolving, and I'm sure mine will too again, but right now I've found my Nirvana. I ended up on a Riedell 172 boot, Roll Line Giotto plate with my old Varsity Plus wheels (with the metal rim). The Roll Line Ice wheels 95A were just a little to soft for multiple 3turns. If anything at this point I'd try an All American Plus wheel. I do like spinning on one foot. Would that extra hardness help? For me the harder wheels are better for spins and turns. you won't have to lift your non pivot wheels so high to get your turn or spin to do a tight pivot because the harder wheels slide and not grab or at least the grab less. Also using a harder wheel, you will be standing straighter with a more correct edge and lean, where a softer wheel allows you to twist and bend and still maintain somewhat of a turn or spin. The downside to the soft wheel also is it is slower and the spin stops sooner. That's my 2 pennies. My advice would be to use the plate that the manufacturer says is best for what you do. If you are contemplating a giotto, with no toe stop, I have to assume dance and/or figures. I wish roll line published cad drawings so one can understand the actual geometries, but I think that info really is their trade secret. They don't even tell you what one plate assembly weighs... and that is an important spec for buying. Setting aside weight and durability, the matrix plate has a lower center of gravity than either the mistral or giotto. I would expect you would feel the giotto is as "twisty" as the mistral. This is because I think the feeling of lacking "twistiness" on the matrix is a direct result of its lowered CG. Spins better because of the lower CG but that lower CG fights footwork. If everything you do needs a dance plug then the giotto would be a good plate to consider because of the lighter plate becuase of less metal mass because it needs not accomodate a stopper. Eyeballing it, it looks to me like the giotto plate might also be a little bit thinner. This would be to save weight. I think that is why they went with ergal aluminum on the giotto. If you do dance and figures, the giotto is pretty much "the" plate for that. But if you have the most fun on a mistral, then maybe that is the plate for you. You know.... I did end up with the Giotto. And yes, it was the best choice. I also tried the Matrix and in my opinion, it was honestly a little better...the only thing that could make the matrix my first choice would be to get rid of the toe stopper/jam plug. 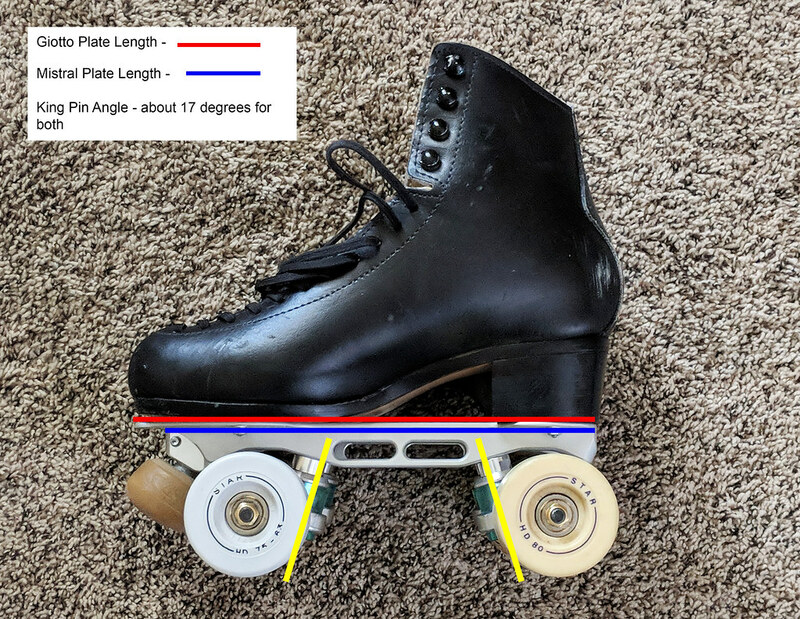 I'm not an artistic skater, though, the only reason I post in the artistic section is because I feel like everyone else on this forum uses those derby-type skates that look like a sneaker with no heal and a huge wide wheel. I really really really hate those. Really. This is the place to ask about art boots.